Obituary – Neuerburg, Donald Lee « Perry High School Alumni Association, Inc.
Rosary will be at 7 p.m. Friday at Brown Funeral home for Donald Lee Neuerburg, 56, route 2, Perry, who died Tuesday morning at Enid Memorial hospital. Funeral mass will be at 10 a.m. Saturday at St. Rose of Lima Catholic church. Rev. Ward J. Pankratz, pastor, will officiate. Burial will be at the Catholic cemetery. Memorials may be made to benefit leukemia research. Brown Funeral home will serve as custodian of memorial contributions. 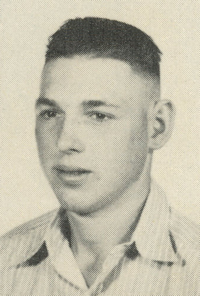 Neuerburg was the son of Leo and Hellen Neuerburg and was born at Perry Feb. 22,1930. He was a 1948 graduate of Perry high school and served with the United States Navy during the Korean Conflict. He and Dorothy Trollope were married July 10,1954, at Perry. Mr. and Mrs. Neuerburg lived in the Enid area 20 years and have resided in the Perry community since 1974. Neuerburg was a self-employed welder. He was a member of St. Rose of Lima Catholic church. In addition to Mrs. Neuerburg, of the home, survivors include four daughters, Linda Pittman, Tallahassee, Fla.; and Mrs. Larry (Donna) Kukuk, Mrs. Mike (Barbara) Marshall and Mrs. Jim (Patricia) Franklin, all of Perry; two sons, Ronnie Steers, Broken Arrow; and Michael Neuerburg, Enid; his mother, Hellen Neuerburg, Perry; 11 grandchildren and one great-grandchild. He was preceded in death by his father in 1968 and a daughter, Sharon Steers Fatherly, in 1970.